Kansas Secretary of State Kris Kobach relied mostly on loans from his running mate Wink Hartman during his 2018 run for governor. Republican Secretary of State Kris Kobach and independent Greg Orman both funded much of their losing races for governor of Kansas through self-financing, campaign finance reports filed Thursday show. Orman spent $1.28 million of his own cash on his campaign and raised about another $1 million from donors. He also spent several thousand dollars on in-kind contributions, including software and staff lunches. Kobach didn’t contribute any of his own money to his campaign. But he relied primarily on money from his running mate for lieutenant governor, Wichita oil magnate Wink Hartman, Sr. Filings show that Hartman loaned the campaign more than $2.31 million from April through December 2018. The campaign raised $3.65 million overall. Hartman forgave the entire balance of the loan in a letter sent to the campaign. In a phone interview, Hartman said he didn’t intend for the campaign to pay him back. Hartman also made a cash donation of $2,000. His business, the Hartman Oil Company, donated $4,000. Self-contributions often come as loans. Winning candidates can frequently draw on donor goodwill and raise money to pay themselves back after a campaign is over, Miller said. But losing an election can make post-campaign fundraising difficult. The Kobach campaign is different than most, Miller said, because the loans came entirely from Hartman, not from Kobach himself. “It’s extremely unusual,” he said. Winning candidate Laura Kelly, a Democrat, did not contribute any of her own money to her campaign. Her running mate, Lynn Rogers, donated $250 in 2017, before joining the ticket. He contributed only $15 in 2018. The Kelly-Rogers campaign raised $3.46 million overall, ending 2018 with almost $60,000 left over. Filings show that the other campaigns ended in the red. Orman had a negative balance of more than $1,000, while Kobach’s campaign spending exceeded revenue by more than $29,000. Kobach campaign spokeswoman and treasurer Danedri Herbert said the report was only accurate up to Dec. 31, 2018. 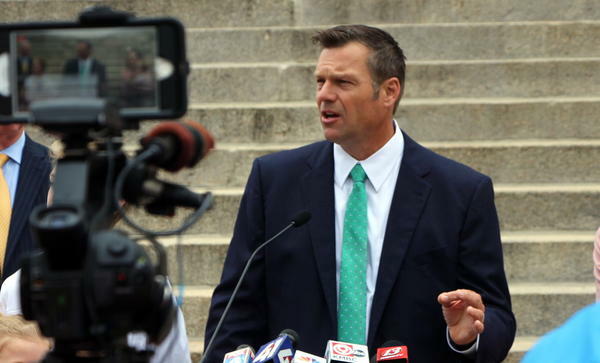 She said the Kobach campaign has since received about $28,000 in refunds from ad purchases at TV stations and has paid all other financial obligations.